Owners with height differentials greater than that specified need to install an adapter known as a "Drop Receiver" into the Coach hitch receiver and insert the towbar into the other end of this adapter. You may ask: "How do I determine whether I need a drop receiver?" If I do "How large should it be?" You will need a tape measure and a few minutes time to answer these questions. First, park your coach on a level surface (do not use your leveling jacks) and if it is a diesel coach with air suspension, fully inflate the suspension to the travel position. Measure from the center of the hitch pin hole to the ground and record this number. For instance, on a newer Workhorse chassis that I recently measured this dimension was 26 inches (66cm). Now park your towed vehicle on a level surface and install any extensions that are necessary to tow the vehicle and measure from the center of the connection pin holes to the ground. On our Saturn Vue this dimension was 15" (38cm). If I were towing the Vue behind this Coach, the differential would be 11inches (28cm). Ideally, I would install a 10-inch (25cm) drop receiver and have an incline of one inch (2.5cm). I could also install an 8-inch (20cm) drop receiver and have a 3-inch (7.5cm) rise. My recommendation would be the former (10"). In all cases ensure that you do not exceed the rating of the Coach Receiver and that all components (tow bar, drop receivers, safety cables) are rated in excess of this rating. Use good quality electrical cable extensions and adapters to ensure good brake, signal and taillight connections. Most major brands such as Blue Ox and Road master inject silicone sealer in the back of the electrical connections to maintain a water resistant seal. I recommend coiled electric and safety cables if your towbar does not have them attached to it. All collapsible tow bars require routine inspection and maintenance. On Blue Ox collapsible bars, the wire ties holding the rubber boot should be cut and removed. Push back the boot and inspect the chrome rod, wipe it clean of dirt and old lubricant, then recoat with high quality heavy-duty silicon spray lubricant. This is the only lubricant to use! Replace the boots, making sure they are reseated and replace the wire ties to retain the boots. Check all levers, flexible joints and parts for tightness, correct operation and integrity. Replace any worn parts or have the bar serviced at your dealer, if you are uncomfortable doing it yourself. Contact the maker of your towbar for the specific safety procedures and maintenance instructions. 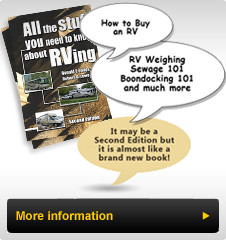 Contact RV Parts Plus for Special Prices on Blue Ox towing systems.